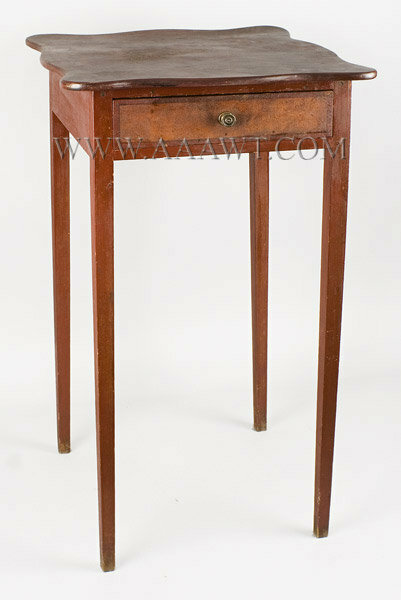 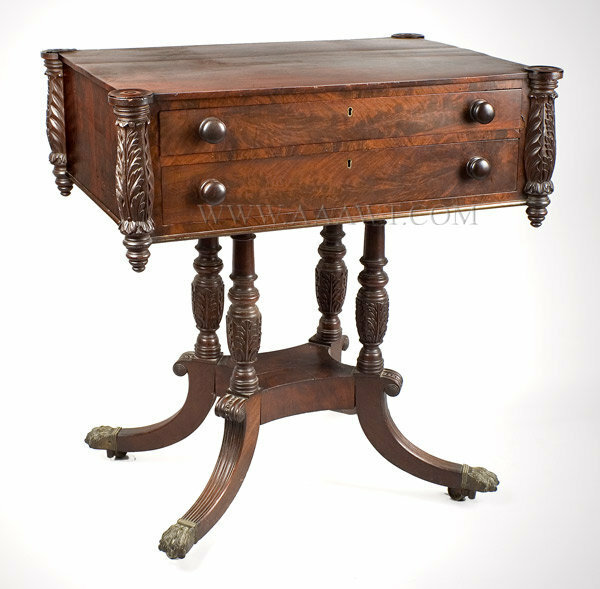 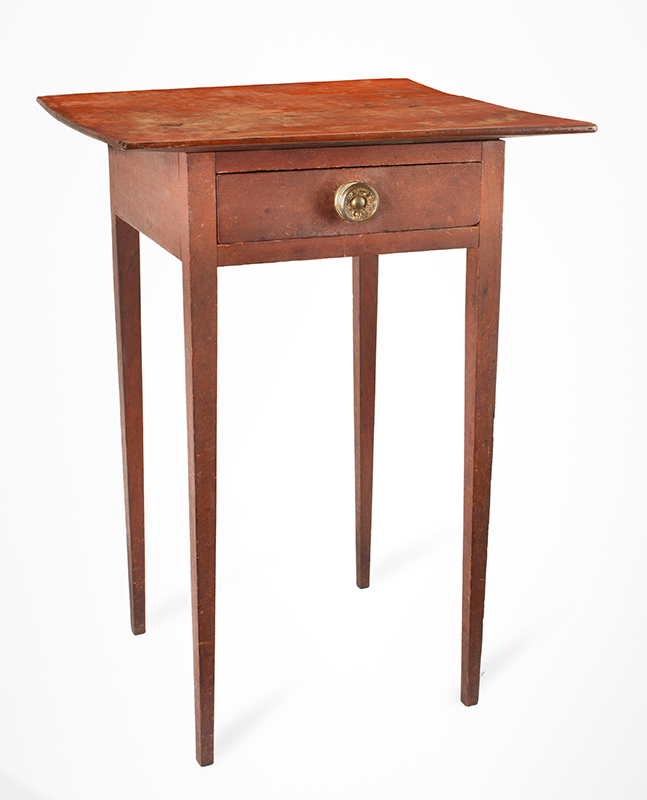 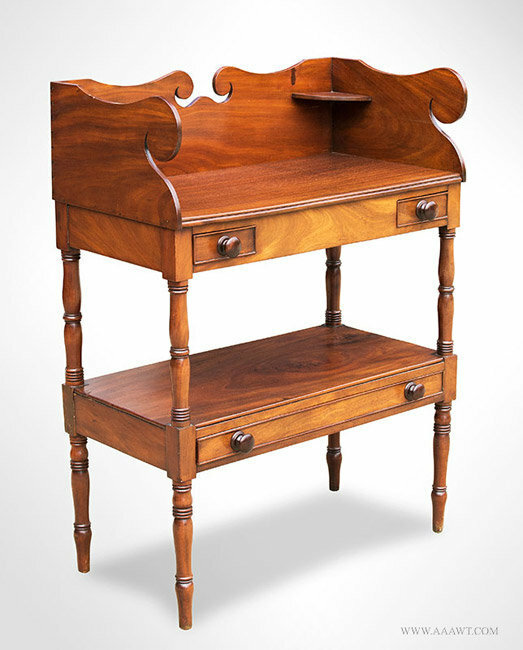 Generously overhung chamfered top over single drawer, the whole raised on tall delicate tapered legs. 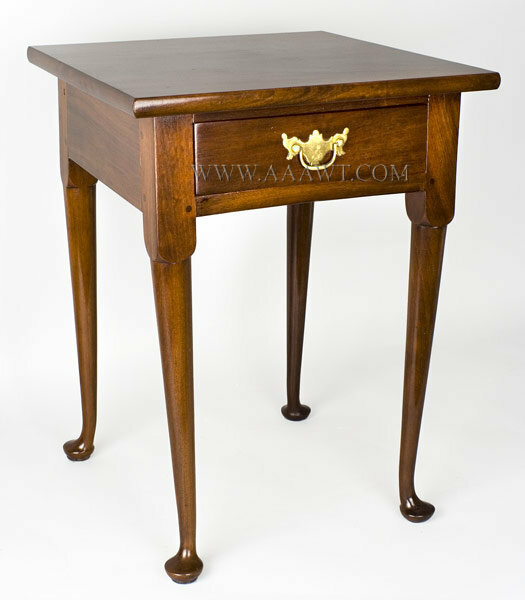 An elegant form. 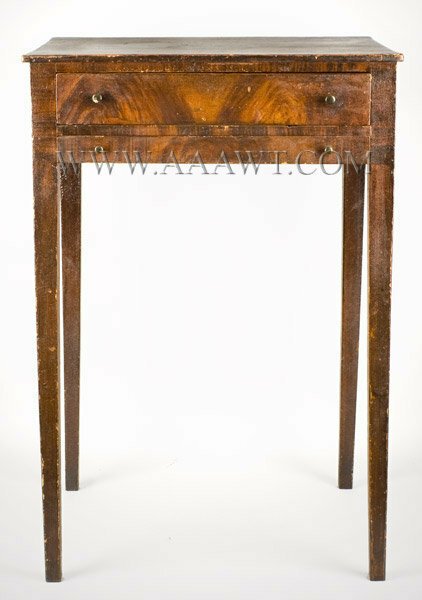 (Slight cupping to top; shrinkage crack and surface imperfections [thinning paint] to top. 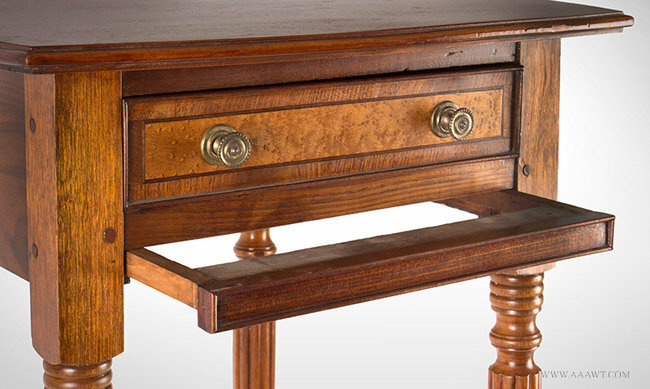 Single short drawer set within case featuring oxbow front and serpentine sides; ovolo corners having turned and split engaged columns on canted corners continuing to ball feet. 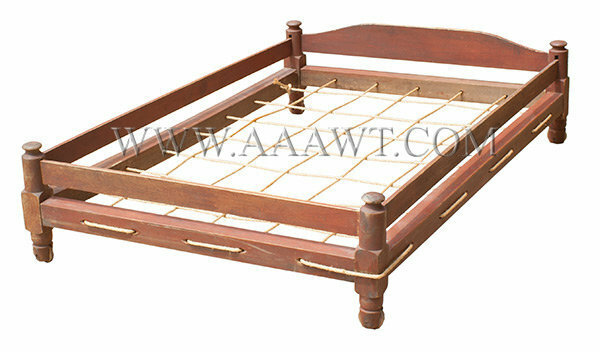 The glove drawer rests on a conforming superstructure raised on dramatic bamboo turned tapering legs resting on spike feet. 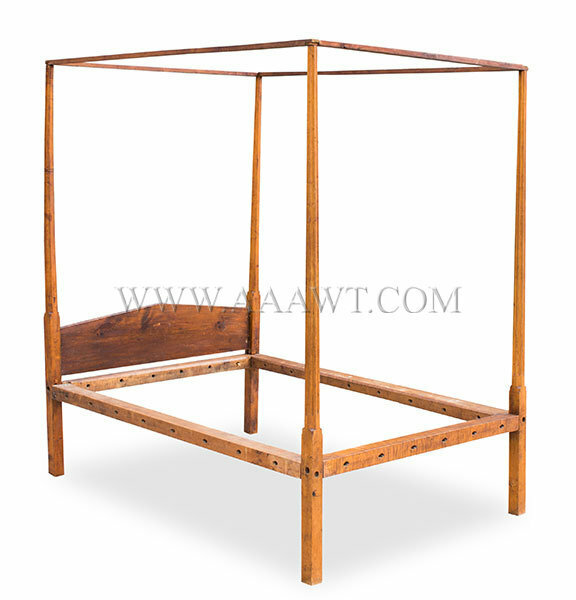 Scrolled backboard above overhanging top with rounded corners, the straight skirt with long-drawer joins square double-tapered legs. 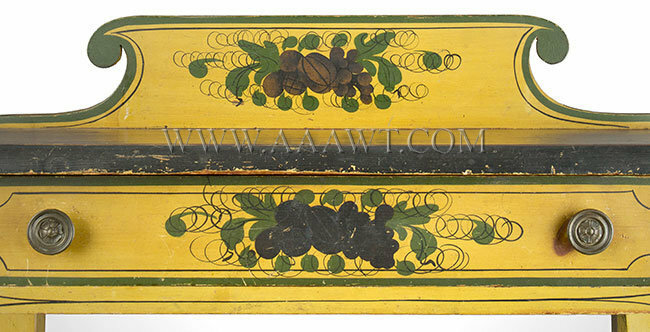 Original yellow surface outlined in green; outstanding vinegar grained deck surface; freehand and stenciled fruits, foliate, and fanciful tendril-like devices ornament the backsplash and drawer front. 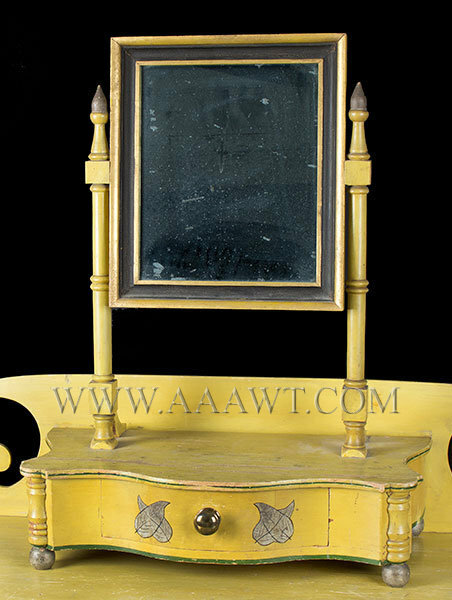 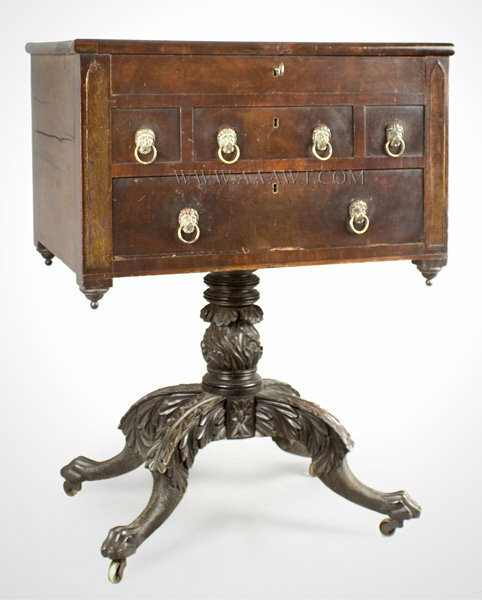 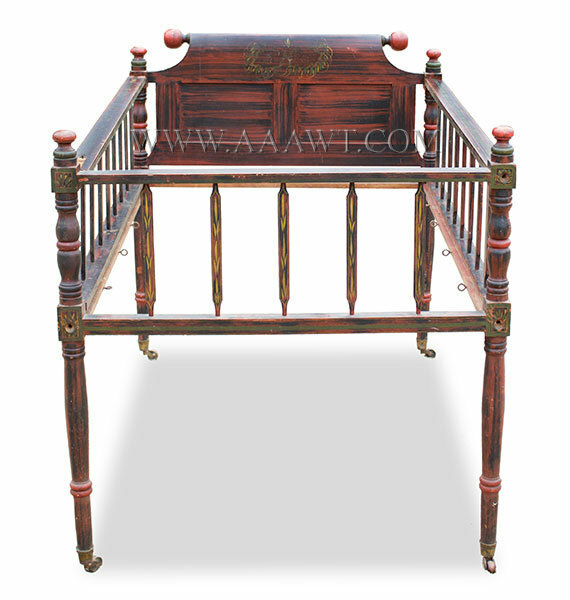 The slightly overhanging top on plain apron having a single drawer above a pullout frame to which a work-bag would have been tied; the whole raised on delicate tapered legs; brass pulls. 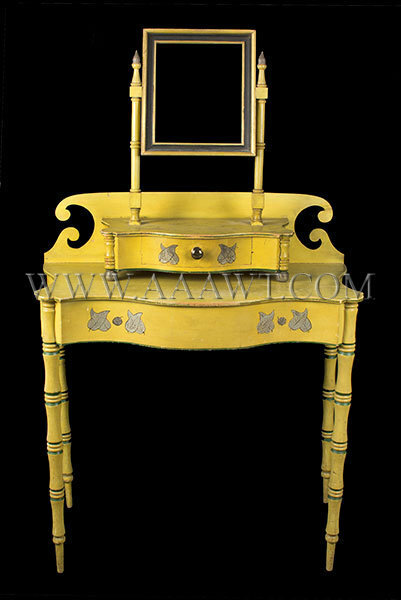 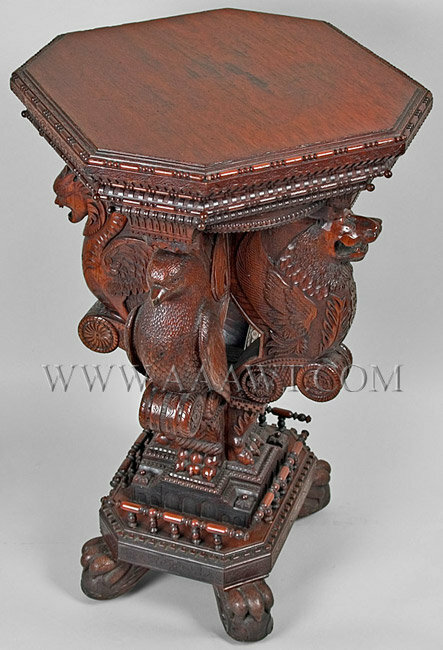 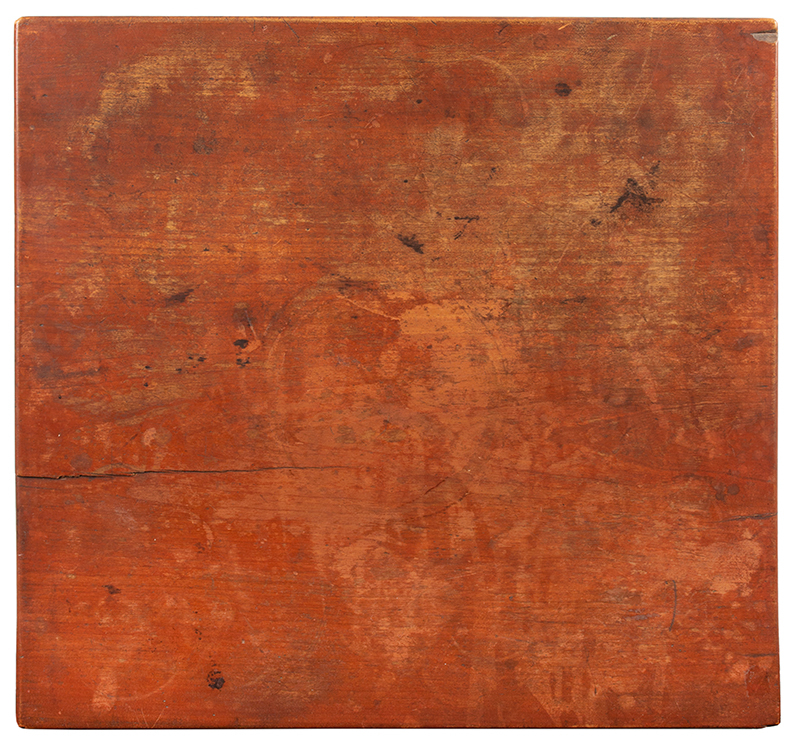 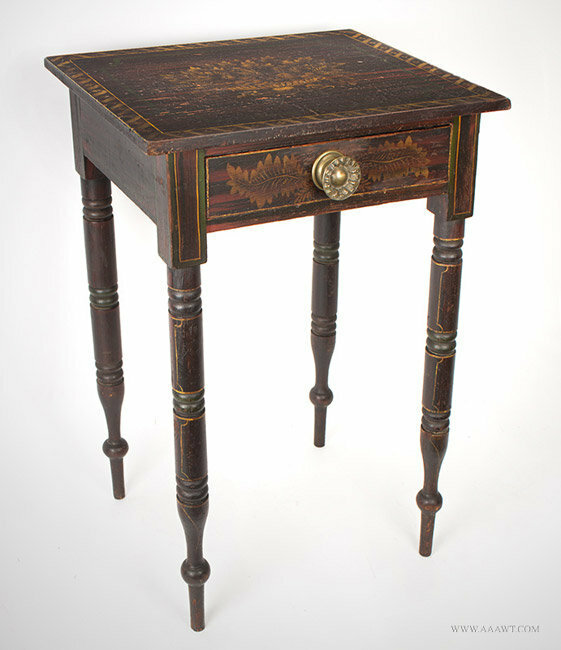 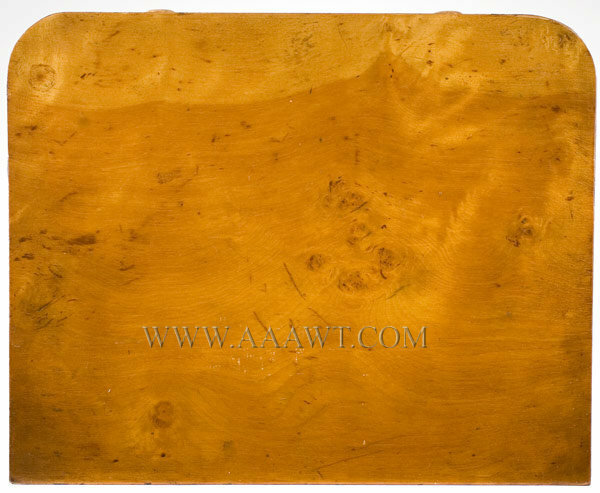 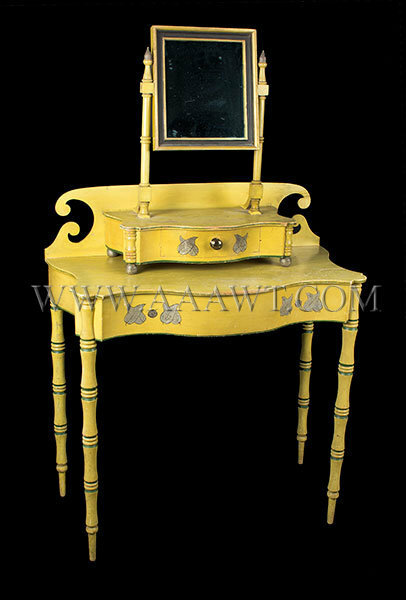 This table remains in a high state of originality including brasses and faux grained surface. 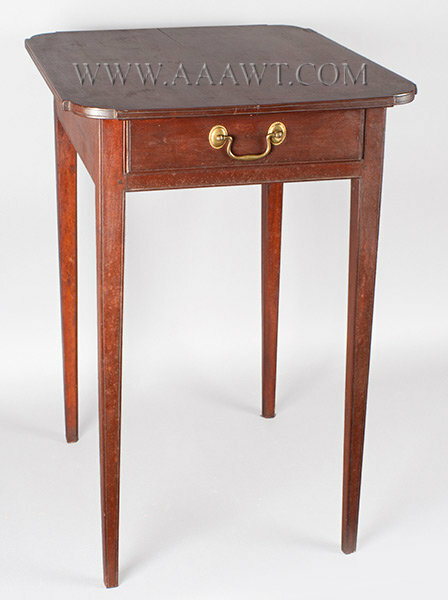 H: 27"; top: 15.25 by 18.5"
The slightly overhanging top with rounded corners over a conforming case having three drawers featuring ovolu-fronts with turned knobs; top drawer is fitted. 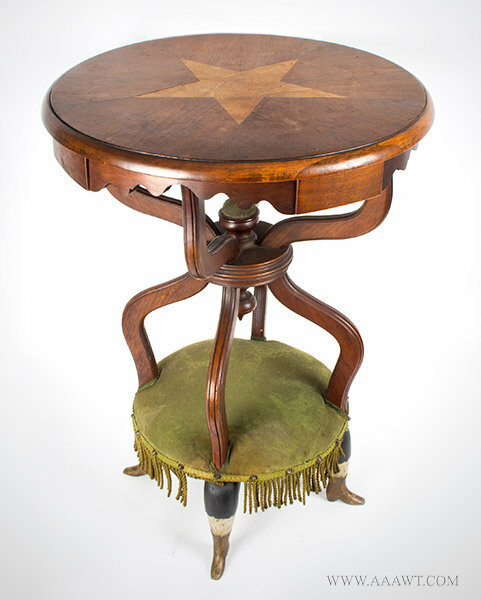 The case is set on a stepped octagonal pedestal ornamented with cove and ogee molding raised on conforming platform resting on scrolled feet. 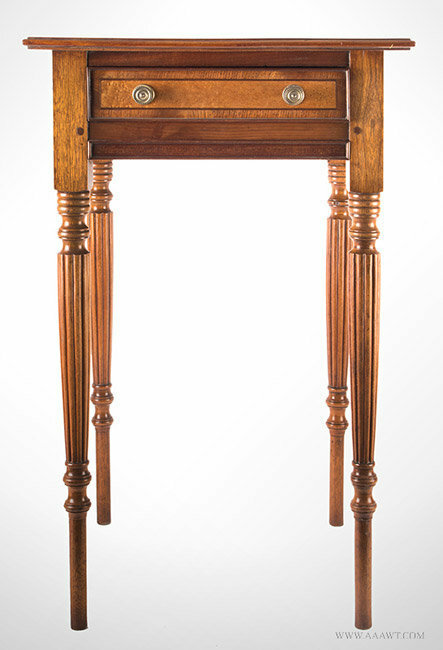 Dimensions: 31" H, 16.5 by 20.5" top. 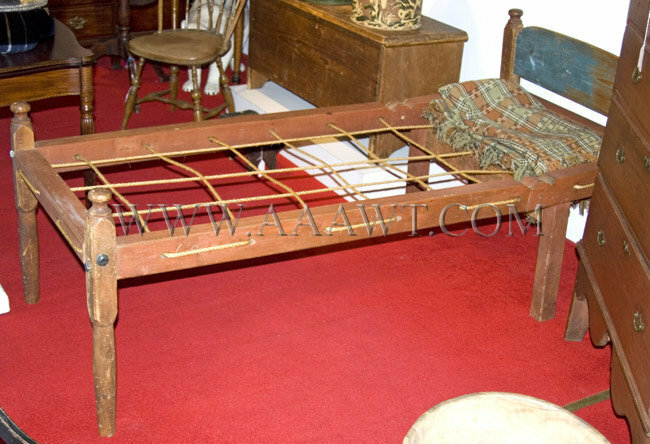 Measures 78" long, 55.5" in width and 52" in height. 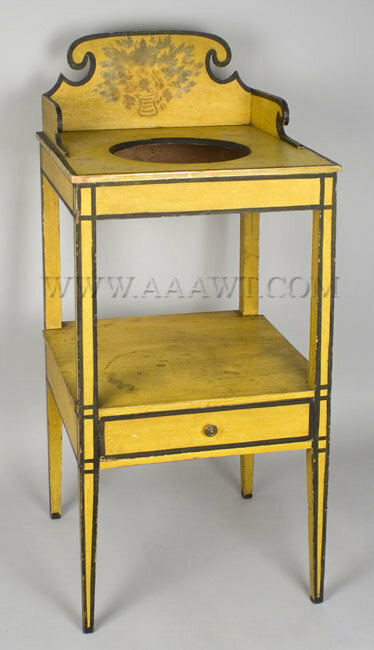 The square top featuring ovolo corners overhanging plain apron with single drawer retaining original brass pull raised on double-tapered out-swept legs. 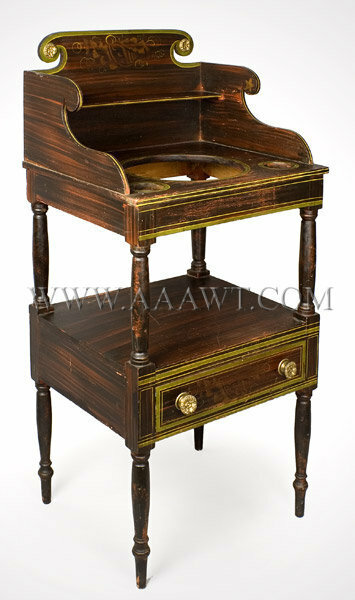 High Scrolled Splash with corner cup-shelves above top with molded front edge; plain apron featuring two short drawers raised on turned legs joined by medial-shelf containing long drawer. 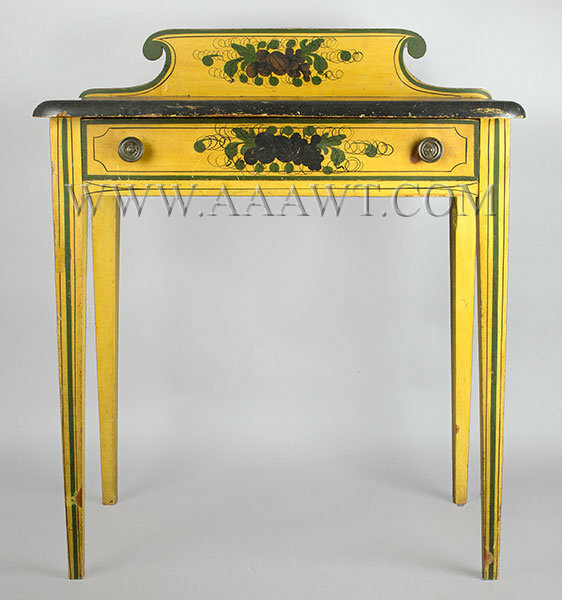 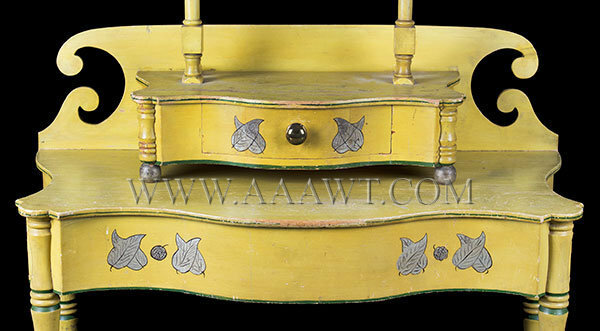 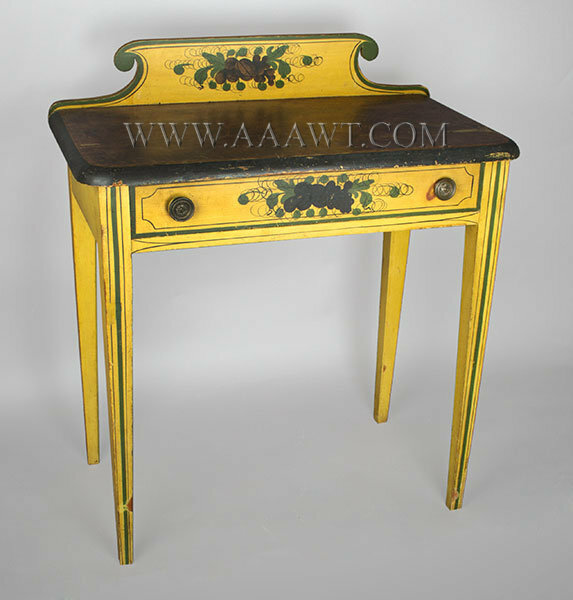 Classic bronze power stenciling; foliate motif on drawer-front, ornamenting the top is an urn of fruits and foliate; yellow and green painted-trim against black and red graining. 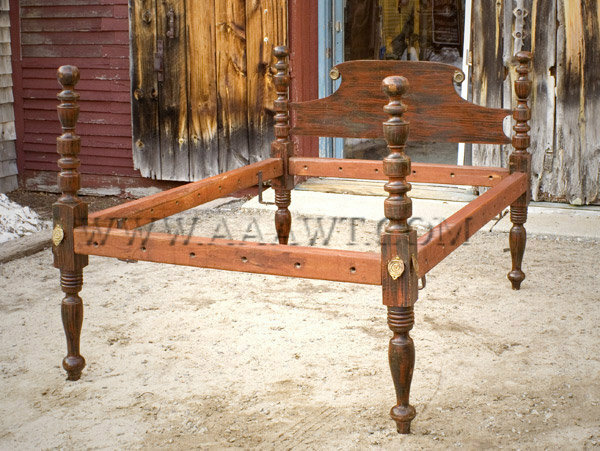 Form and function combined; folk furniture, whimsical utility! 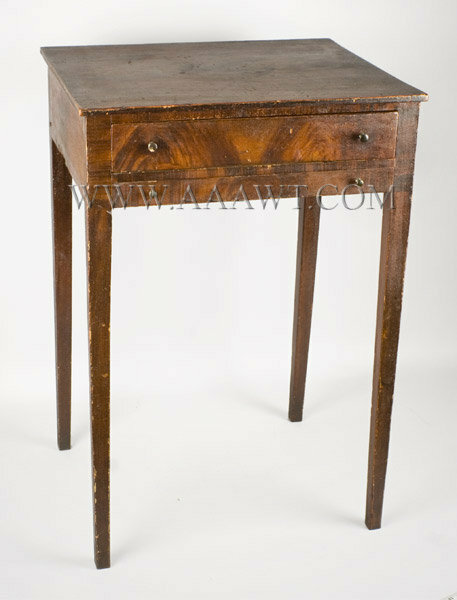 A nearly square oversized top on plain apron with single drawer raised on block and turned legs. 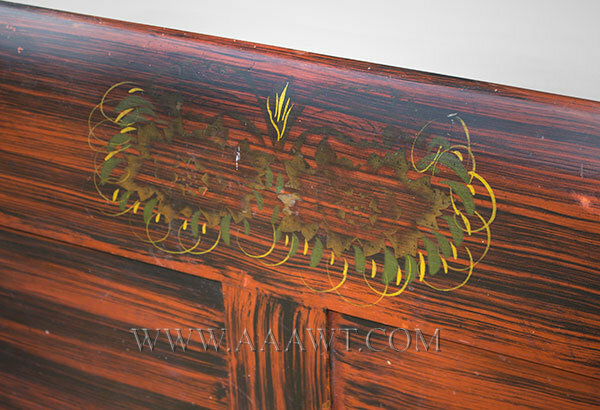 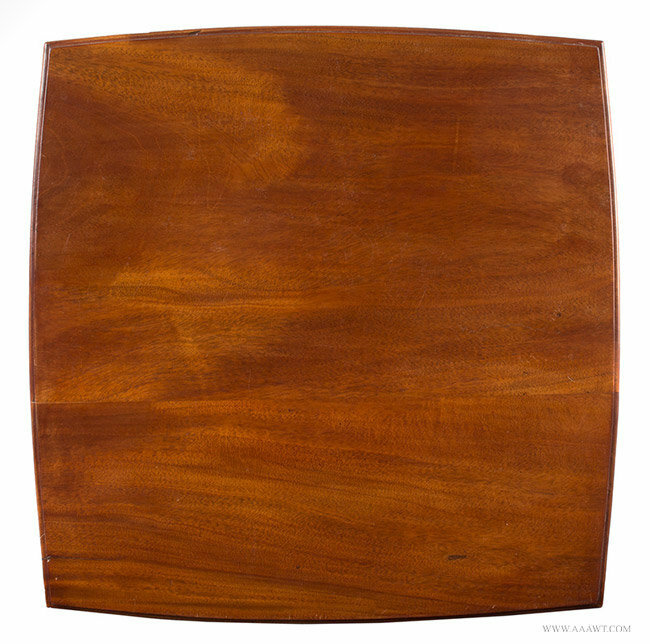 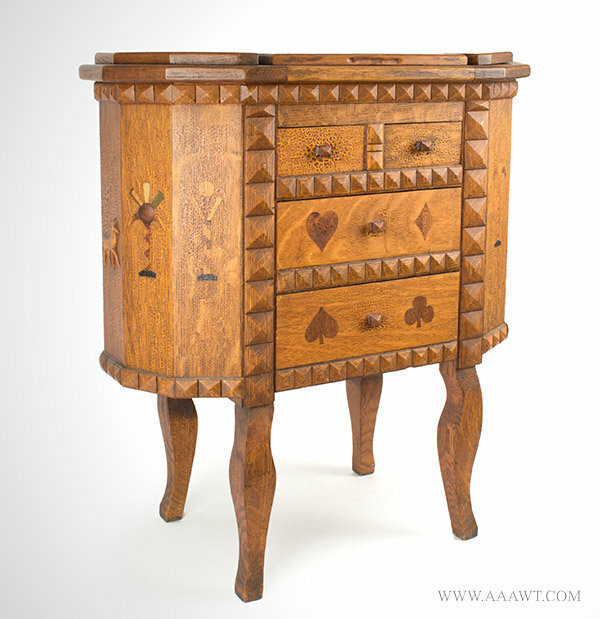 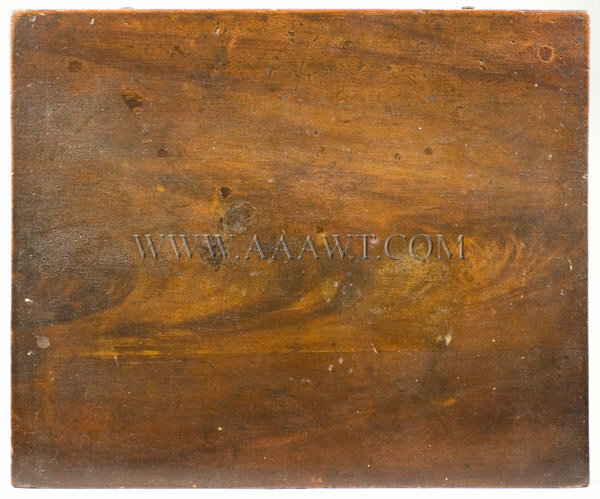 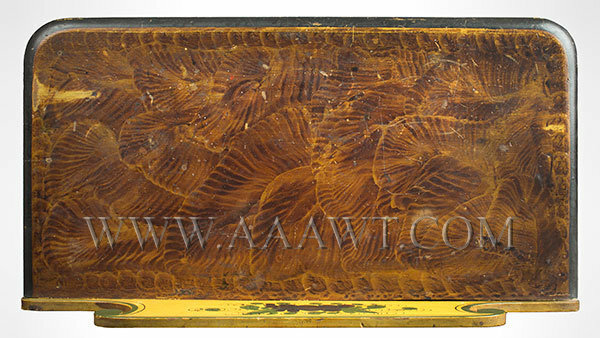 Fantastic fancy grain-painting; the top grained to represent veneer panels with the drawer simulating matchbook veneer; all-over paint in superb original condition. 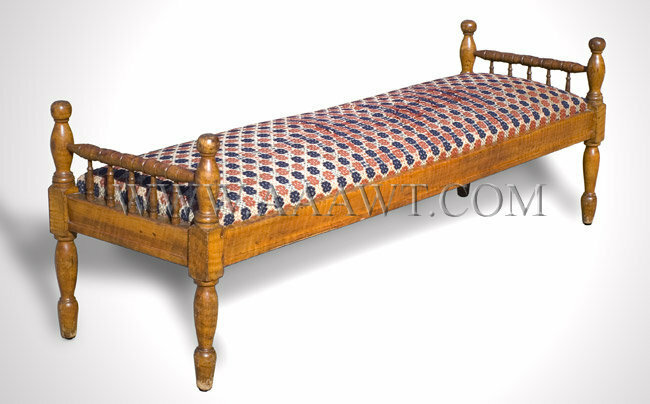 Dimensions: 30.5" H, 24 by 23.75" top. 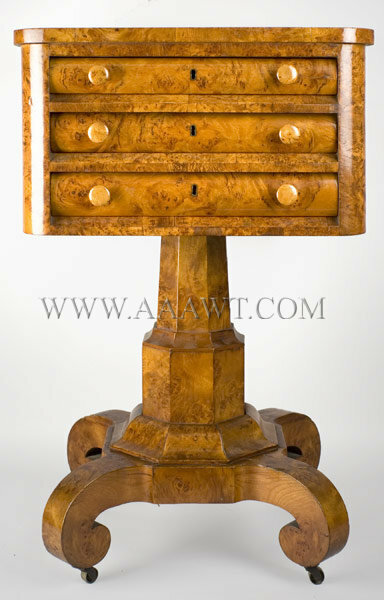 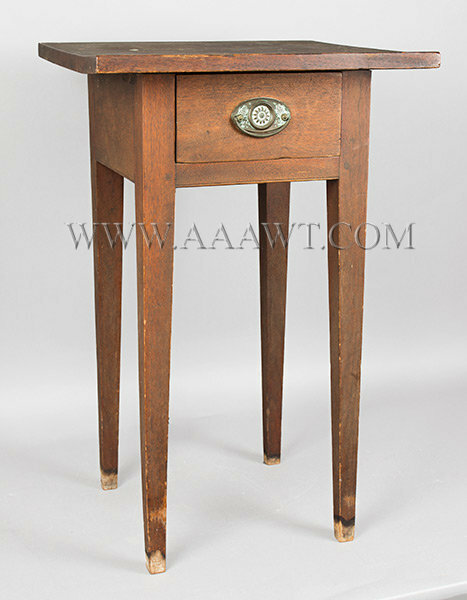 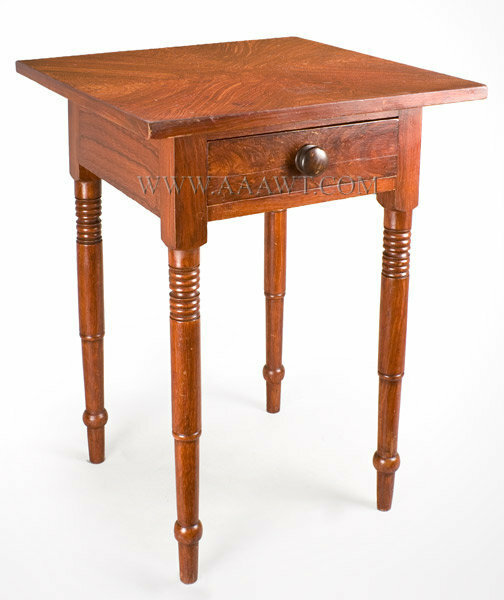 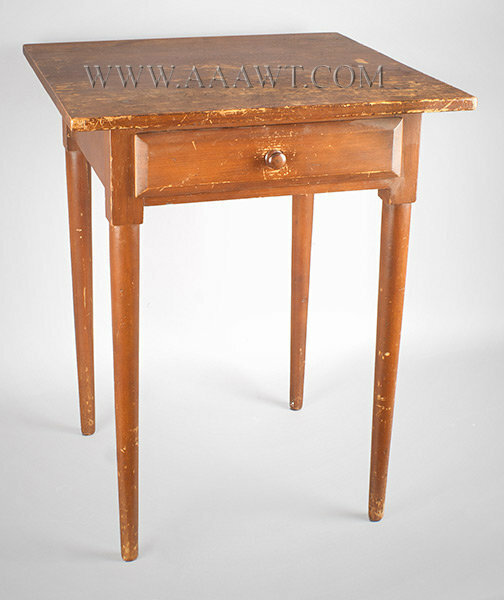 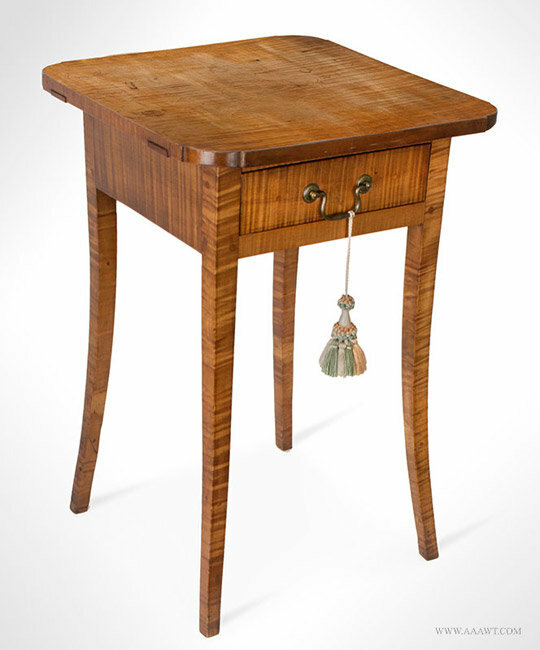 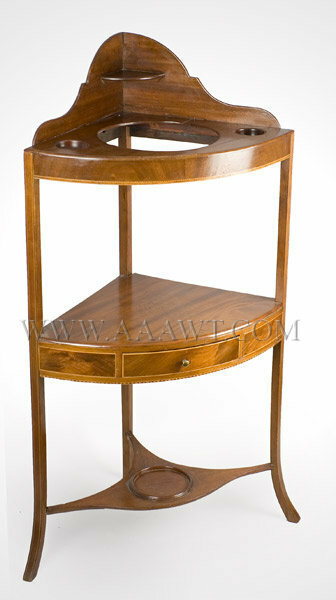 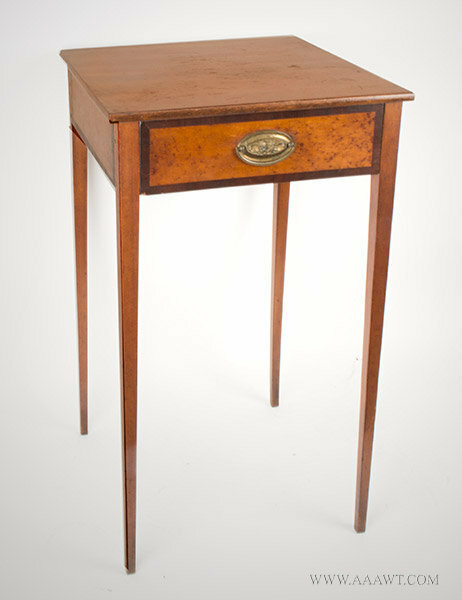 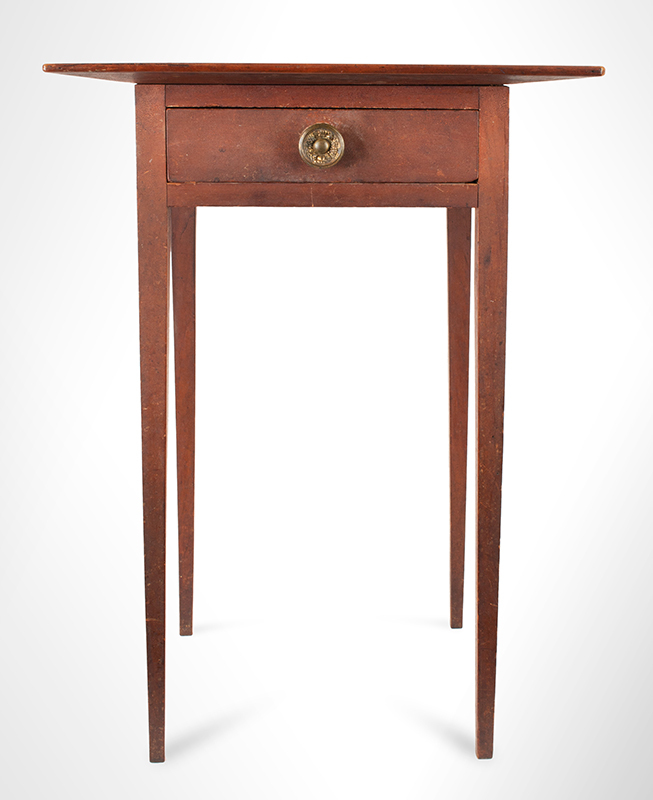 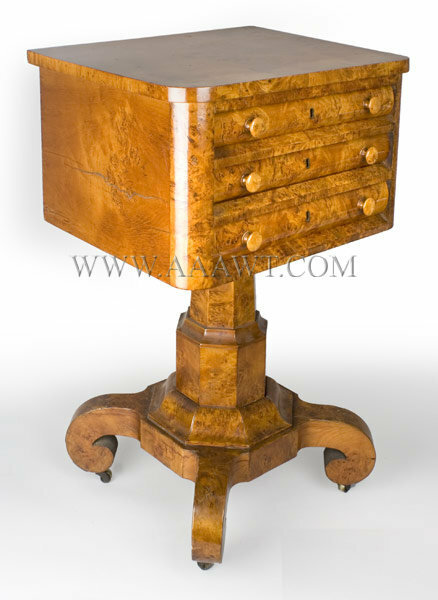 A Massachusetts Sheraton inlaid mahogany, mahogany veneer and birds eye maple veneer two-drawer worktable. 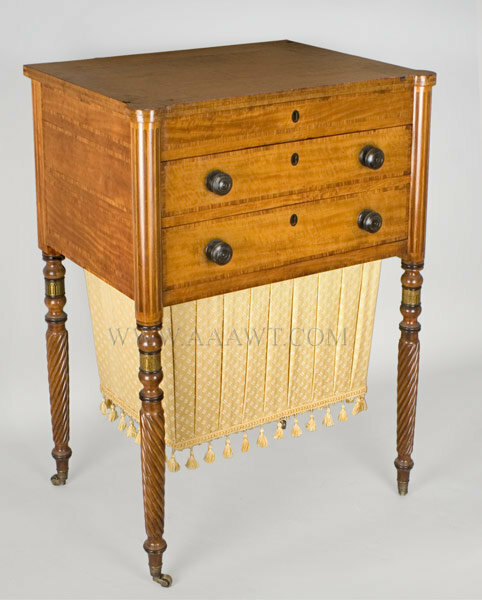 The rectangular cross-banded top with canted corners and inlaid octagonal edge above a conforming case fitted with single compartmented-drawer and a bag-drawer below; each drawer with string-inlaid birds eye maple veneered panels...raised on tapered ring-turned fluted cylindrical legs having ringed cuffs. 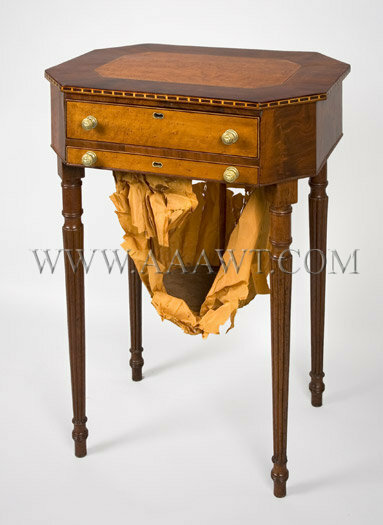 The table remains in excellent condition including the bag-drawer frame and round bag bottom; bag fabric is greatly compromised. 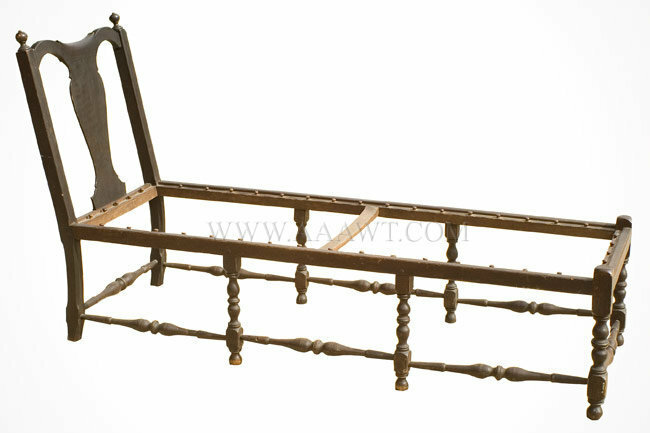 The brass pulls are possibly original. 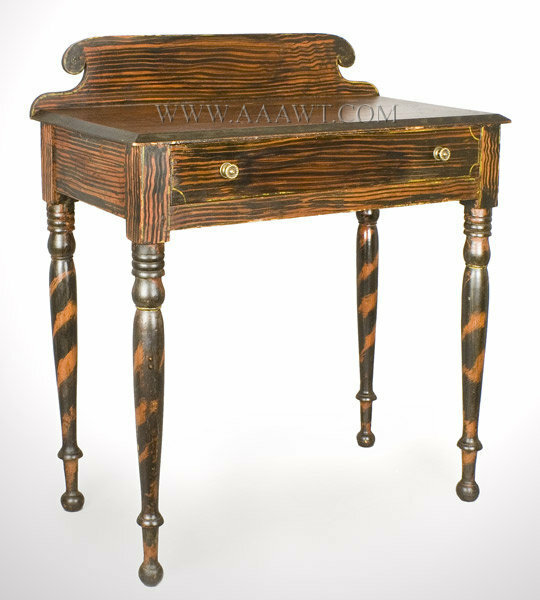 Height: 27.75"; Top: 20.25 by 15.25". 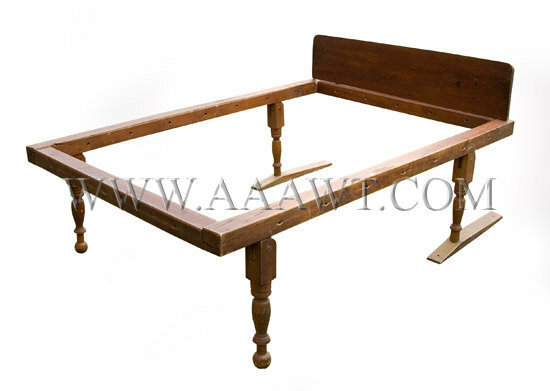 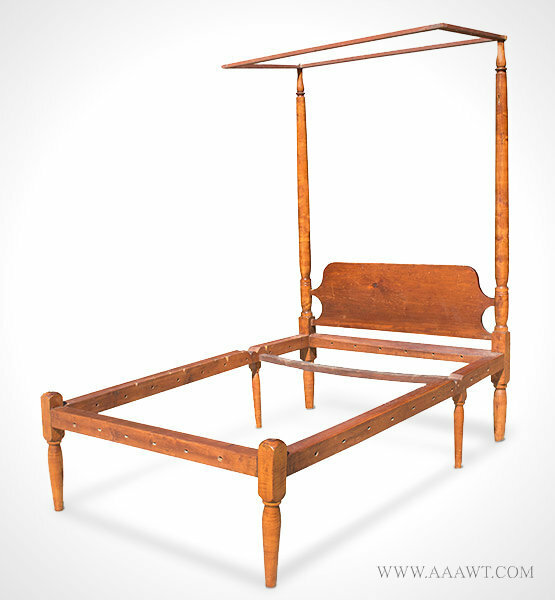 The nearly square top on plain apron having single drawer; the whole on turned tapering legs resting on pad feet. 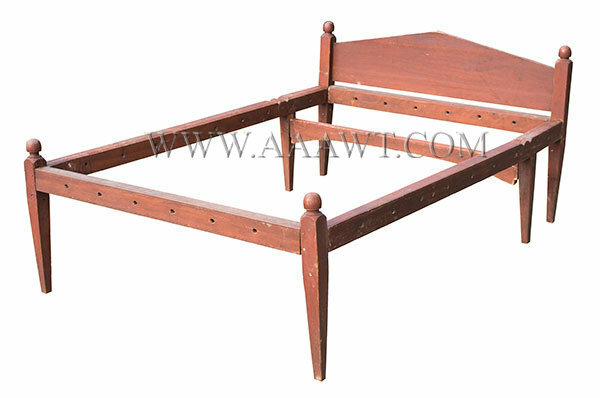 Dimensions: 22" H, 16.75 by 16.25" top. 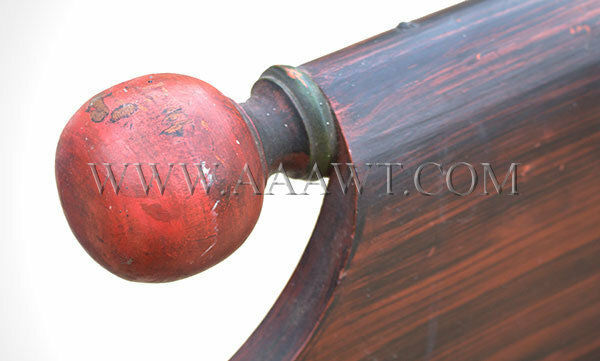 This example with turned tapered cylindrical posts centering an arched headboard has molded rails and is painted red with the headboard being blue. 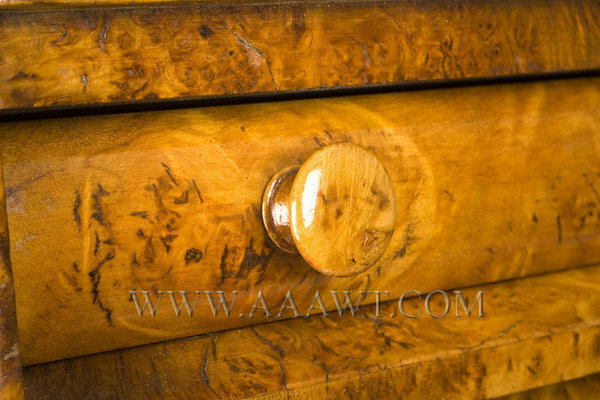 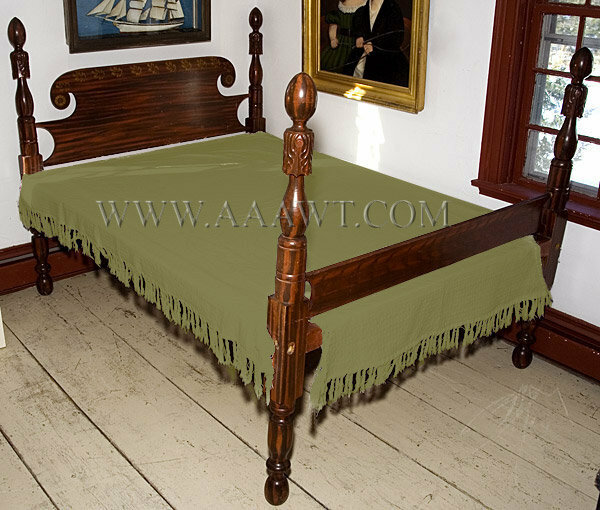 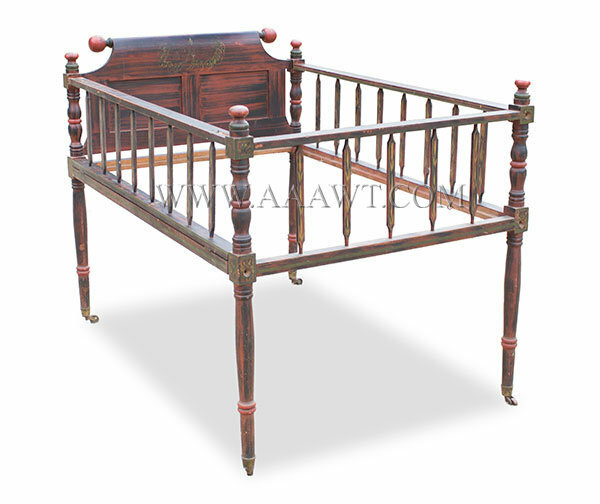 It is curios that the headboards tenon is half the depth of the mortise that receives it. 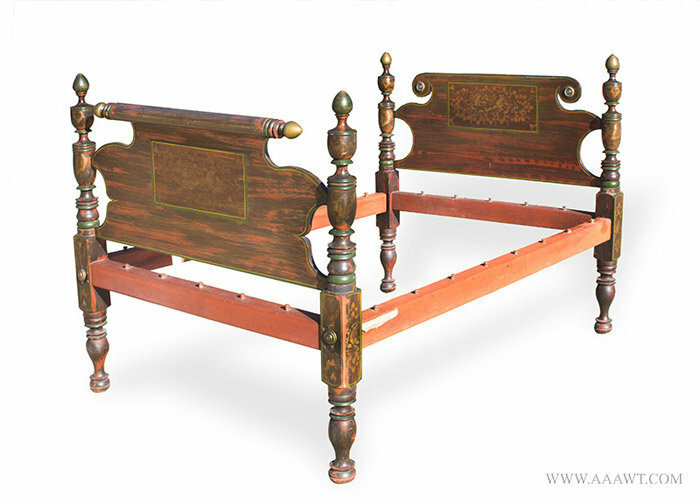 The width is perfect...perhaps an early replacement yet a great combination; a marriage made in heaven. 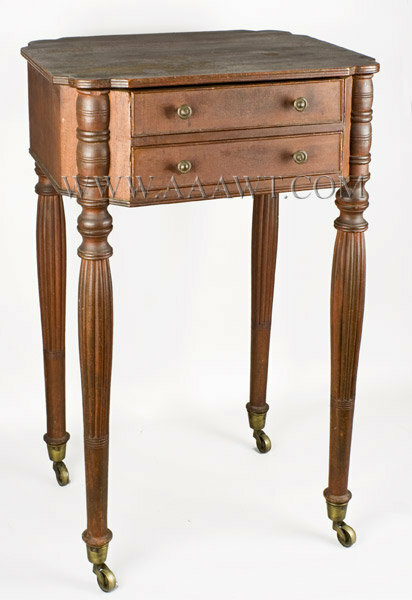 The turned urn-form head-posts centering a pine headboard joined by original side-rails to turned and fluted urn form foot-posts. 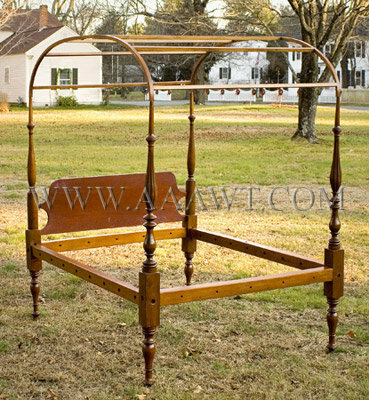 Complete with reproduction arched tester. 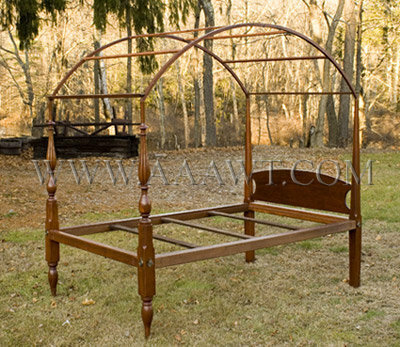 Dimensions: 79.5" overall height, 40.5" headboard height, 74" long, 54.5" wide. 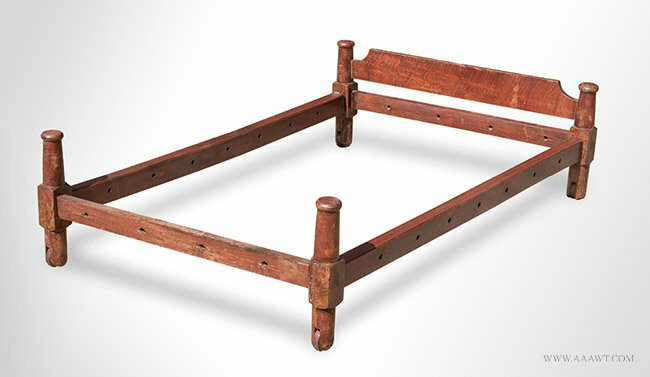 Four posts with original tester (canopy) frame; tapered pencil posts centering pine headboard joined by retrofitted side-rails to the turned and fluted urn-form foot-posts. 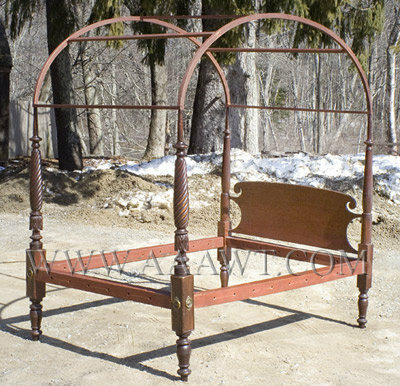 Dimensions: 81" overall height, 37" headboard height, 86" long, 53.5" wide.